Forging is one of the common manufacturing processes, that shapes a metal piece by applying compressive forces on it. Forging could be performed under different temperature conditions, like hot forging, warm forging and cold forging. The forging process uses hammers or presses to squeeze and deform the material into high strength parts. The forging manufacturing process is completely different from the casting one, where the molten material is poured into a mold (see difference between forging and casting). Another significant advantage over the other manufacturing methods (such as casting and machining) is that, forging improves the mechanical properties of the material by refining its grain structure and making it tougher and stronger. This makes forging served in various industrial applications. The hot forging process involves the application of extreme heat, with the desired temperature depending on the type of metal. For instance, the average temperature required for deforming steel is approximately 2,100 degrees Fahrenheit; for aluminum alloys, the temperature range is 680 to 970 degrees Fahrenheit; for copper alloys, the range is 1,300 to 1,470 degrees Fahrenheit. The high temperature is necessary to prevent strain hardening during deformation. Hot forging is typically the best choice for steel forgings used in technical applications and for deforming metal that has a high formability ratio. 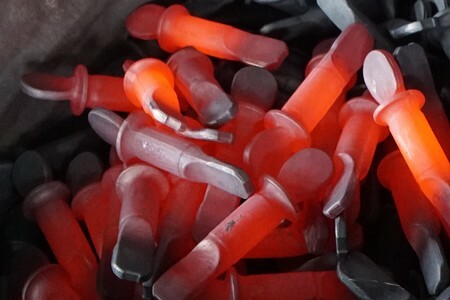 Key advantages of hot forging include a homogenized grain structure, low work hardening, increased ductility and a reduction in chemical inconsistencies. On the downside, hot forging offers less precise tolerances, the potential for warping during cooling and the possibility of an adverse reaction between the metal and the surrounding environment. Main advantage of hot forging is that as the metal is deformed the strain-hardening effects are negated by the recrystallization process. Parts possess increased ductility which makes them desirable for many configurations. Porosity free surface quality enables a wide range of completion operations such as polishing or surface treatment. Efficient process when working with harder metals such as steel. A close association and cooperation is required between the buyers and producers of hot forgings for achieving the best possible product at the best possible price. With recent technological advancement in the hot forging industry, close collaboration and close working with the forger is required. By keeping knowledge about the recent developments, the buyer can ensure cost effectiveness with high quality products. Forging involves a fair amount of artistry and customisation. Henceforth, it is very crucial to involve the forger into the designing and specification phases of product development. The hot forging buyer should have a general know-how about the equipment and methods used in the hot forging process. Moreover, it is very important to confirm that the forger has the equipment and the facility to produce that part. The buyer should have the knowledge about the capability of the forger to provide services like heat treating, machining, testing, quality inspection, testing and so on. Last but not the least, buyer should a general knowledge about the scale of the potential hot forging supplier. The buyer can ensure that the hot forging company is used to producing the volume required. Fly Forge provides hot forging process in closed die forging method, which is performed in excellent conditions with state-of-the-art machinery for perfect results. We work close with our customers to understand their specific needs and find the best possible solution. Contact us now if you have any hot forging project! Despite the word “cold,” cold forging actually occurs at or near room temperature. The most common metals in cold forging applications are usually standard or carbon alloy steels. One of the most common types of cold forging is a process called impression-die forging, where the metal is placed into a die that is attached to an anvil. The metal is then hit by a descending hammer and forced into the die. Depending on the product, the hammer may actually be dropped on the metal numerous times in a very rapid sequence. Forging processes are generally not considered to be an eco-friendly part of the manufacturing process, but cold forging is probably the most eco-friendly process of its kind in operation today. For companies that care about reducing the carbon footprint of their products, the cold forging process can help reduce waste and decrease energy use compared to forging alternatives that use heat. In addition to the reasons listed above and the eco-friendly factor, cold forming is also one of the most cost-effective methods of forging in today’s market. For example, estimates indicate that this process can reduce your part cost as much as 40 to 60%. 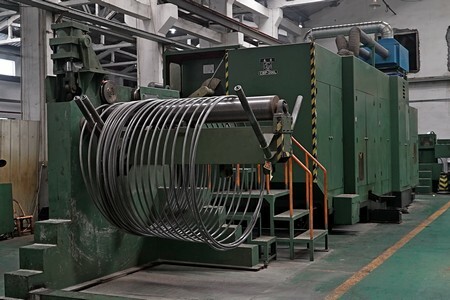 The main difference between hot and cold forging may be summarized as follows: The cold forging manufacturing process increases the strength of a metal through strain hardening at a room temperature. On the contrary the hot forging manufacturing process keeps materials from strain hardening at high temperature, which results in optimum yield strength, low hardness and high ductility. Finally, a manufacturer would choose one process over the other because of economic and quality reasons. The decision is based on the required functions of the desired component, the industry and if it’s a mass production or a low volume of customized parts.